The Citadel at Georgia Southern, to be played at Allen E. Paulson Stadium in Statesboro, Georgia, with kickoff at 6:00 pm ET on Saturday, September 19. The game will not be televised. The contest will be streamed on ESPN3.com, with Matt Stewart providing play-by-play and Wayne Gandy supplying the analysis. The game can be heard on radio via the various affiliates of The Citadel Sports Network. WQNT-1450 AM [audio link], originating in Charleston, will be the flagship station. Mike Legg (the “Voice of the Bulldogs”) will call the action alongside analyst Lee Glaze. Jay Harper will report from the sidelines. When I was thinking about what to write for this week’s preview, what first came to mind wasn’t as much the upcoming contest, but rather Georgia Southern’s move from the SoCon to the Sun Belt and the long-term ramifications for that program and school. That’s because, from a programmatic perspective, the matchup with the Eagles is arguably the most meaningless game The Citadel has played since the Bulldogs made a trip to face Wyoming in 2002. I’ll explain what I mean by that later. First, a look at Georgia Southern. I’ve written about the school’s history before, but I think it’s worth revisiting. Georgia Southern was founded in 1907, and classes began the following year. It was originally known as the First District Agricultural & Mechanical School, but despite an initial focus on agriculture, the school would become a teacher’s college for the majority of its history. There had been a football team at Georgia Southern as far back as 1924 (at that time the institution was called the Georgia Normal School), but the sport was dropped during World War II. By the early 1980s, the school had increased in size (it would be granted university status in 1990), and there was a groundswell of local and institutional support for reinstating football. To re-start the program, the school hired longtime Georgia assistant coach Erk Russell, who was already a legend in the Peach State. He was, to say the least, a great hire. Russell took the football program from club status to I-AA, fashioning an eight-year record of 83-22-1, with three national titles. Beyond the win-loss record, the coach’s impact and influence on the school was immense. Ludicrously, Russell is not in the College Football Hall of Fame. He is actually ineligible under current rules. The shadow of Russell at Georgia Southern did have negative repercussions, inasmuch as he was an impossible act to follow. The redoubtable Paul Johnson was the only one of the head coaches who succeeded him to really measure up to Russell in the eyes of the fan base. Tangent: speaking of Johnson and other former Georgia Southern head coaches, the most fascinating matchup this week in college football is the one between PJ’s Georgia Tech squad and Notre Dame, which employs Statesboro persona non grata Brian VanGorder as its defensive coordinator. The two men aren’t exactly fast friends, and that’s being polite. The essential issue that coaches following Erk Russell faced — how do you top what he did? — could also apply, in a general sense, to Georgia Southern and the move to FBS. After a while, some supporters got restless. They had already sampled the pot of gold at the end of the FCS rainbow, and now they wanted to know if the gold at the end of the FBS rainbow was shinier, regardless of the consequences. It took a while, but eventually the fan base started moving in the “we want FBS” direction. Those not so sure about the idea were eventually brushed aside. A new director of athletics with an “FBS or bust” attitude and mission, Tom Kleinlein, pushed things along. Eventually, Georgia Southern made the move to the Sun Belt. Now, Georgia Southern is an FBS school. Its first season in the Sun Belt was full of success, as it won the league with an 8-0 conference record. I’m not sure the Sun Belt was anticipating that, or if its administrators were really excited about having the league won by a program that had gone 4-4 in the SoCon the year before. Despite winning an FBS conference, though, Georgia Southern didn’t get to go to a bowl game, because it was still in transitional status. That didn’t sit well with fans. …Last month, Sun Belt commissioner Karl Benson told USA TODAY Sports that even if Georgia Southern became bowl eligible through that route, they would be placed at the bottom of the league’s pecking order out of deference to the longstanding FBS members. Currently, the Sun Belt has four bowl eligible teams for three contracted spots. Kleinlein is now arguing, however, that Georgia Southern (9-3) should be treated differently because it won the conference championship outright. Benson didn’t immediately return a call seeking comment. Of course Benson didn’t return Dan Wolken’s telephone call. He was probably on the horn with Kleinlein, asking him to at least wait another year before burning every bridge in the league his school had just joined. The Citadel will be the first SoCon team to visit GSU since the Eagles left the SoCon, but don’t expect Georgia Southern to appear regularly on Bulldog schedules — not when games at ACC or SEC foes can bring much more money. This game was scheduled before Houston and athletic director Jim Senter were hired. In other words, if Georgia Southern wants to schedule The Citadel again, the military college is going to demand a lot more cash. $175,000 isn’t going to be nearly enough; The Citadel is going to want more than twice that amount of money. Maybe more than three times that amount of money. In a way, it illustrates a problem Georgia Southern now has as an FBS member when it comes to scheduling home games. Schools that pay FCS schools big bucks for a “guarantee game” can afford to make those payments, because they have large stadiums and huge budgets. That isn’t the case for the folks in Statesboro. Georgia Southern may have expanded Paulson Stadium, but 25,000 seats is a far cry from the likes of the facilities at Florida State, or South Carolina, or even North Carolina (opponents of The Citadel last year, this year, and next year). That also affects Georgia Southern’s ability to get home-and-home games (or two-for-one deals) with non-conference FBS foes, especially from major conferences. So far, GS hasn’t scheduled such a series with a P5 school. Of course, if the Big 10 gets its way, the days of Power 5 conference schools scheduling FCS programs may be coming to an end. Even if that happened, though, it probably still wouldn’t be worth it for schools like The Citadel to play Group of 5 conference schools for less money. The potential chain reaction that could occur if the entire P5 decided not to schedule FCS programs would likely be complicated (and a subject for another post). I think it is probable that The Citadel would simply not play any FBS schools, with the gridiron landscape possibly changing to such a degree that no FCS schools would. 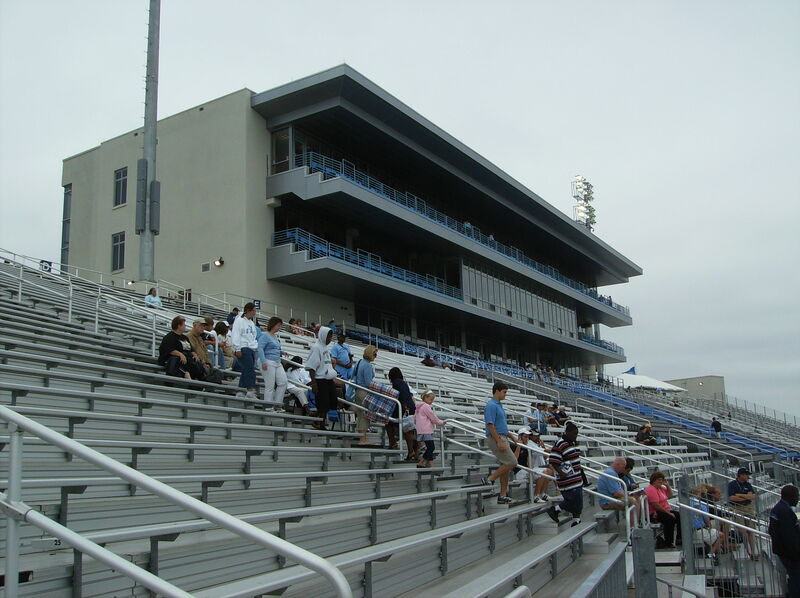 …After chartering a flight to Laramie and spending a night there, The Citadel will just about break even on the trip, [Les] Robinson said.”Thank goodness for LSU [another FBS game The Citadel played during the 2002 season],” Robinson said. After securing the LSU game, Robinson offered to negotiate a settlement with Wyoming.”They didn’t want to negotiate,” Robinson said. “We couldn’t offer them $100,000 or anything like that. We couldn’t make it worth their while.”As it is, the Bulldogs will play 12 games without a week off this season. Johnson said his players might not even put on pads this week in practice in an effort to stay fresh. Also, the Bulldogs will have their fair share of fans at this game. It’s not the worst place in the world to play a game for recruiting purposes, either (Exhibit A being The Citadel’s starting quarterback, Dominique Allen, who grew up about an hour’s drive from Statesboro). However, ultimately this matchup is unlikely to define the season for The Citadel in any way. It’s a game the Bulldogs would like to win, but it’s not a conference game, a home game, an in-state game, or a game against a high-profile opponent. It provides a limited benefit to the program from a financial standpoint. To be honest, I’ve always been a bit dubious about Georgia Southern venturing into the land of FBS, though not for reasons of on-field competitiveness. I don’t think any veteran observer of college football was shocked the Eagles dominated the Sun Belt last year. Mildly surprised, maybe, but not shocked. However, this is a school that, even as it has grown, still has issues to overcome when it comes to big-money athletics. Its alumni base, while growing, is still much smaller than most FBS schools; the market demo is younger than many other areas (so there is less disposable income floating around); and the surrounding region doesn’t have a huge corporate base. Also, Georgia Southern has to compete with numerous major-conference FBS programs within a 300-mile radius, including Georgia, Georgia Tech, Clemson, South Carolina, Florida, Florida State, and Auburn. Hey, I could be wrong. I’ve been wrong before, and I’ll be wrong again. I just happen to think there is a good chance in about ten years, there might be more than a few Georgia Southern fans wondering what the administration was thinking when it decided to chase that other rainbow. Here is a comparison of The Citadel and Georgia Southern in select statistical categories for the 2014 season. The Citadel’s stats are for SoCon games only (seven contests). Those opponents: Wofford, Chattanooga, Western Carolina, Mercer, Furman, Samford, and VMI. For Georgia Southern, I included eleven of the Eagles’ twelve games. After some consideration, I decided to remove the statistics from Georgia Southern’s 83-9 victory over Savannah State. Thus, the statistics below are for the rest of the games the Eagles played last season, which came against the following opponents: North Carolina State, Georgia Tech, South Alabama, Appalachian State, New Mexico State, Idaho, Georgia State, Troy, Texas State, Navy, and ULM. Who will start at quarterback for Georgia Southern on Saturday? As glad as [Georgia Southern head coach Willie] Fritz is to have Ellison back, he’s staying close to the vest when discussing how big of a role Ellison will play this weekend. With a full week of film study and practice still in front of the Eagles, Fritz wasn’t yet ready to say whether Ellison or [Favian] Upshaw take the first snap against The Citadel. Ellison was suspended because of an academic issue dating back to the fall semester of last season. Ellison failed to accrue enough credits to satisfy the NCAA standard and was initially handed a four-game suspension. By taking on additional classes over the spring and summer semesters – and by earning solid grades in those classes – Ellison was able to get his suspension reduced. “It was a learning experience for me,” Ellison said. “School has to come first. I kind of overlooked that last year. Ellison is hoping that this run-in with The Citadel is as successful as the last. In 2013, Ellison was the star of the game as the Eagles pulled out a 28-21 win. Ellison passed for 138 yards, ran for 135 more and scored the game-winning touchdown with 1:59 to play. Regardless of who starts at QB, Willie Fritz’s offense will look the same. It isn’t the triple option offense of Paul Johnson or Jeff Monken, but it is conceptually not dissimilar. Run primarily out of pistol formations, Georgia Southern uses more zone blocking as opposed to the inside veer that is the foundation of past GSU offenses. For the quarterback, it’s not too much of a change; he still progresses through his reads like he did before. Zone blocking is different for the offensive line, but it still favors quicker linemen that can get to linebackers quickly. That’s what GSU’s line was already built for under Monken. Besides, it’s not like they had never used zone blocking before. It’s just a different focus. The zone read is hardly a concept unique to Georgia Southern. Everyone runs it at least a little bit. What’s unique about Georgia Southern is more how committed they are to it. They are very much an option offense as opposed to an offense that dabbles in the option once in a while. You can read a lot more about Georgia Southern’s offense in that post. In fact, you should. Education is the surest way to get ahead in life. In its eleven games last season against FBS competition, Georgia Southern threw the ball 20.3% of the time. Passing yardage accounted for 22.5% of the Eagles’ total offense. Contrast that with Georgia Southern’s 2013 season (again omitting a game against Savannah State). That season, the Eagles threw the ball 14.0% of the time, and passing yardage accounted for 21.5% of Georgia Southern’s total offense. So, despite a new coach and a different “style” of offense, there really wasn’t a big fundamental change in approach. – Note: 2014 statistical references to follow are for all 12 games Georgia Southern played. Kevin Ellison rushed for 1108 yards last season, averaging 6.5 yards per carry. He completed 55.5% of his passes, with five touchdowns against three interceptions, averaging 7.6 yards per attempt. Fabian Upshaw completed 70.4% of his throws (19-27), averaging 10.6 yards per attempt, with two TDs and one pick. Upshaw rushed for 385 yards, averaging 9.6 yards per carry. While both Ellison and Upshaw are capable of making things happen, the biggest playmaker on the Eagles offense is running back Matt Breida, who rushed for 1485 yards last season and 17 TDs. He averaged 8.7 yards per rush attempt, leading the nation in that category. During his press conference, Mike Houston stated that Breida also led the nation in “explosive plays”, i.e. plays of over 50 yards from scrimmage. He had seven last season. Breida had his first “explosive play” of this season last week, a 70-yard TD run against Western Michigan. He finished that game with 176 yards rushing (on only 11 carries) and four touchdowns. He is joined in the backfield by fellow running back L.A. Ramsby, who rushed for 691 yards and 12 TDs last season. “L.A.” stands for “Little Al”. His father is Big Al. Wide receiver B.J. Johnson led the Eagles in receptions last season with 23, averaging 13.6 yards per catch. Three of those receptions were for touchdowns. Houston referred to Georgia Southern as being “huge up front”, and he wasn’t kidding. The Eagles’ starting offensive linemen average 6’4″, 305 lbs. Left guard Darien Foreman, the lone returning starter on the offensive line, was a preseason first-team All-Sun Belt pick. Right guard Roscoe Byrd is a transfer from UAB. Georgia Southern runs a 4-3 base defense. Of course, teams often change things up when facing The Citadel’s triple option. The Eagles have a great deal of size along the defensive line, including the imposing Jay Ellison (no relation to Kevin Ellison), a 6’1″, 310 lb. nose tackle. The Citadel’s offensive line will have its hands full with Ellison, a second-team preseason Sun Belt selection. Darrius Sapp, listed as Jay Ellison’s backup on this week’s two-deep, started both of Georgia Southern’s first two games at defensive tackle. Sapp weighs 330 lbs. Starting defensive end Lennie Richardson is 27 years old. Richardson began his collegiate career at Troy before transferring to Georgia Southern. After a year in Statesboro, Richardson enlisted in the U.S. Army and spent 3 1/2 years as a tank gunner before returning to GSU. Linebackers Deshawntee Gallon and Antwione Williams both have fifteen tackles so far this season for the Eagles. Williams has already graduated from Georgia Southern (the same is true for Lennie Richardson). Free safety Matt Dobson returned two interceptions for touchdowns last season. Dobson was a second-team preseason all-conference choice. Placekicker Younghoe Koo is an athlete, as this “trick kick” demonstrates. However, he’s coming off a one-week suspension after a DUI arrest. Alex Hanks handled placekicking duties last week for the Eagles and is listed ahead of Koo on this week’s depth chart. Georgia Southern punter Matt Flynn is in his first year as the starter. Koo is listed as his backup this week, though the depth chart describes this as an “OR” situation. Long snapper Jake Banta is another refugee from the currently shuttered UAB program. Derek Keaton and Montay Crockett were the primary kick returners for Georgia Southern last season, and are back this year. Keaton also returns punts. – Georgia Southern’s “dress roster” includes 90 players from thirteen states. There are 68 natives of Georgia, 11 Floridians, five residents of South Carolina, three Texans, and one player each from Alabama, Missouri, Mississippi, Ohio, Oklahoma, Arkansas, New Jersey, California, and Nevada. – For the second straight week, The Citadel will play in a contest designated “Military Appreciation” Day (or Night). The game ball will be brought in by the Golden Knights Army Parachute Team. Georgia Southern players will have a Department of Defense decal on the back of their helmets. 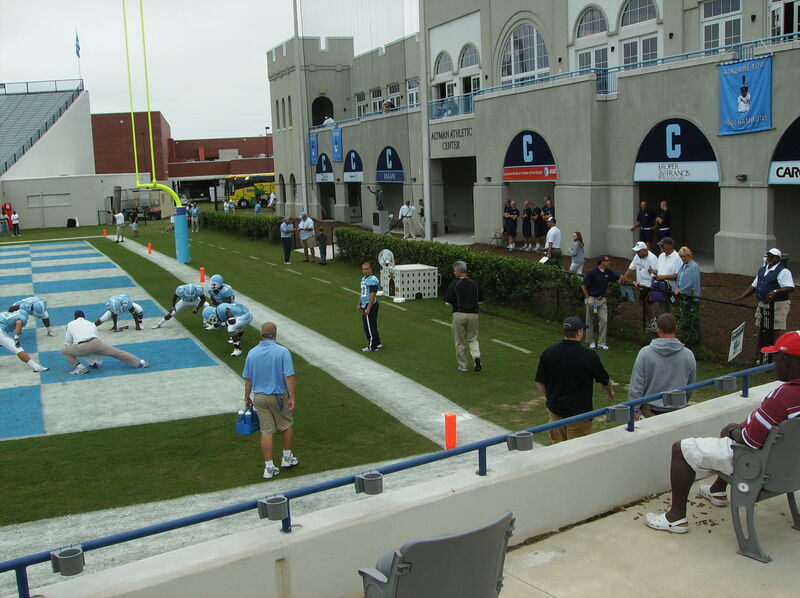 The Citadel last played Georgia Southern in Statesboro in 2013. It was Military Appreciation Day at Paulson Stadium for that game as well. – The ESPN3 analyst for this game, Wayne Gandy, was a consensus All-American offensive tackle at Auburn in the early 1990s. Gandy had a 15-year NFL career with four different teams, starting 205 games. – The sideline reporter for the Georgia Southern radio network is Danny Reed, who Bulldog fans remember from his three years as the “Voice of the Bulldogs”. Reed will become the play-by-play voice this season for the Eagles’ men’s basketball and baseball teams, and will take over gamecalling duties for football in 2016. I think Reed will become the second person to work as the play-by-play voice for both The Citadel and Georgia Southern. Longtime Charleston radio man Ted Byrne also called games for both schools (and worked College of Charleston games at one point, too). – Lainie Fritz, sports anchor/reporter for WCBD-TV in Charleston, is the daughter of Georgia Southern head coach Willie Fritz. – Per the SoCon weekly release, The Citadel has the top two active sack leaders in the conference. Mitchell Jeter has 13.5, most among current SoCon players, while Mark Thomas is second with 11.5 career sacks. – Mike Houston is undefeated against schools from the state of Georgia in his head coaching career. He is 2-0, with wins over Fort Valley State and Mercer. – As of this writing, the National Weather Service forecast for Saturday in Statesboro: high of 87 degrees and sunny, with a low that night of 67. Weather should not be a factor during the game. – Per one source that deals in such matters, Georgia Southern is a 25 1/2 point favorite over The Citadel this week. The over/under is 56. I think Saturday’s game will be competitive, assuming The Citadel doesn’t go into turnover mode on offense. The Bulldogs may have trouble stopping Georgia Southern’s high-powered attack, but I believe The Citadel can control the ball enough on offense to limit the total number of possessions and frustrate the Eagles. Earlier in this post, I wrote that this game isn’t that important for The Citadel in the grand scheme of things. However, I fully expect the Bulldog players to give it everything they’ve got — and why not? If you’re going to play the game, you might as well try to win. The Citadel at Elon, to be played at Rhodes Stadium, with kickoff at 1:30 pm ET on Saturday, September 24. The game will not be televised. There will also be a webcast on Bulldog Insider (subscription service, and perhaps audio-only), and the game can be heard on radio via The Citadel Sports Network, with “Voice of the Bulldogs” Danny Reed calling the action. A successful athletics program contributes to a sense of community and institutional pride, is of great interest to students and alumni, and contributes greatly to national visibility. The above sentence is from Elon’s website; not from its athletics site, but an offshoot from its primary educational URL. It’s part of the “Elon Commitment“, which is Elon’s strategic plan for the next ten years — or really eight, as it was formulated in 2009. Elon is big on long-range goals, and is also big on accomplishing those goals. As I wrote two years ago, the school has had an amazing transformation over the past four decades. The money that has been put into Elon is remarkable; it is surely one of the great fundraising success stories in higher education. The administration at Elon also deserves credit for its master plan to spend that money, a plan helped considerably by a very sensible land purchase made in the early 1970s. School president Leo Lambert noted two years ago that the Elon Commitment would require about $500 million to come to complete fruition, which is a very ambitious target, but it’s hard to bet against Elon not getting there given what has already been accomplished. Alumni Field House is pursuing Leadership in Energy and Environmental Design (LEED) certification, which is the nationally recognized benchmark for the design, construction and operation of high performance green buildings…The automatic irrigation system will be part of the campus wide system, which is supplied with reclaimed stormwater collected on campus. There is an interactive touch screen…[with] access to the campus wide electricity monitoring system, which provides real-time electricity consumption information for over 50 campus buildings and will include the Alumni Field House. Elon’s athletic peers are fine universities such as William and Mary, Richmond, Furman and Davidson, schools that believe strongly in the student-athlete ideal and understand that the intercollegiate athletic experience is wonderful preparation for leadership in life. I have to point out that Elon’s “athletic peers” include a school that doesn’t play scholarship football (Davidson), a school that competes in the Atlantic 10 in all sports save football and women’s golf (Richmond), and a public school with quite a few more varsity sports than Elon (William and Mary). I am not completely sure what Elon’s ultimate goal is for its athletics program, other than fully funding athletics scholarships in all sports, a benchmark expressly stated by the school. I was listening to the SoCon media teleconference as Jason Swepson, Elon’s new head coach, started talking about the upcoming game. Swepson spent the last four seasons at North Carolina State under Tom O’Brien, but prior to that he had been on O’Brien’s staff at Boston College, which is Swepson’s alma mater. Swepson is a Massachusetts native, and four years in the south haven’t made a dent in his accent. A question about defending the triple option was posed to him by Burlington Times News sportswriter Adam Smith. Swepson noted that Elon had allocated ten minutes to defending the option for all of its preseason practices, and had also “tweaked” its weekly in-season practice schedule for this week to be better prepared for it. Swepson also mentioned that Phoenix defensive coordinator Ed Pinkham had experience with defending the triple option against Army and Navy while working at Colgate and Rutgers (Pinkham spent five years on staff total in New Brunswick, including serving as the co-DC for the last two seasons). That got me thinking. What kind of defense is Pinkham likely to employ against The Citadel? Could he take a page from his days at Rutgers? Rutgers beat Army in both 2009 and 2010, both triple option years for the Black Knights; Rutgers won easily, 27-10, in 2009, holding the Cadets to 213 total yards. In the second meeting, Army outgained Rutgers in yardage by over 150 yards (404-250) but lost 23-20 in OT, thanks in part to two lost fumbles (in a game marred by Eric Legrand’s injury). The Scarlet Knights last played Navy in 2007 and 2008. Rutgers beat the Midshipmen 41-24 in the first meeting, which won’t go down as one of Rutgers’ best moments. Navy rushed for 254 yards but passed for only 35, and had three of those throws intercepted. In 2008, however, the Middies amassed 289 yards rushing, a further 89 passing (including a TD), and did not turn the ball over, leading to a 23-21 Navy win. I decided to consult The Birddog, who as I have mentioned before is the world’s leading Navy football blogger and a noted devotee of the triple option. What kind of scheme did Rutgers run against Navy’s attack? Now, I don’t understand all the “x and o” stuff about the triple option, which is one of the few things I have in common with Craig James, but from what I gather, the free safety taking the pitch man might mean that occasionally running a play more to the middle of the field could be worthwhile. Something like, say, the midline option. Another team that ran a similar defensive scheme was Georgia, against Georgia Tech in 2009. It didn’t work real well. One other thing about this particular defensive scheme is that one way to combat it is the ol’ play-action pass. I am guessing that would be a call Kevin Higgins would be more than willing to make. Craig Candeto used to call the QB-FB midline his favorite play because he only had one read, and the DT tends to take the fullback most of the time. Oh, one other thing: The Birddog told me that Kansas ran a similar defensive look against Georgia Tech last week, as did Delaware against Navy three weeks ago. Combined rushing yardage for the Jackets and Midshipmen in those two games: 995. As there can only be one Phoenix at any time, please refer to the Phoenix in the singular. Elon is 2-1 on the season, with victories over Division II Concord (42-10) and a new member of the MEAC, North Carolina Central (23-22). The Phoenix lost its season opener 45-14 to Vanderbilt. I don’t think the games against Concord and Vandy were too surprising (although it should be noted that the Phoenix actually had more total yards than the Commodores). The contest with North Carolina Central shouldn’t have been, either. Elon, heavily favored, outgained its opponent 525-219 and had almost 15 more minutes of possession. The Phoenix kept the Eagles in the game, though, by committing five turnovers; one of Elon’s three interceptions was returned 75 yards for a touchdown. North Carolina Central had a chance to win the game late, but a field goal attempt went awry and Elon hung on for the victory. Phoenix quarterback Thomas Wilson played, after some concern over whether he would be able to do so, and threw for 416 yards (albeit with those three picks). This is Wilson’s first season as the starter, following the seemingly never-ending career of Scott Riddle. Wilson did have one previous start at Elon, though — the game last year against The Citadel. Riddle was unable to play in that game due to injury, but Wilson more than held his own, leading a methodical attack. He made no big mistakes and was particularly effective on third down (9-13) and in the “red zone” (Elon scored a TD on each of its four trips inside the 20; two of those TDs were one-yard rushes by Wilson). Wilson’s primary target is wide receiver Aaron Mellette. Mellette caught 16 passes last week, for 237 yards and a touchdown. The Eagles had no answers for him, but they shouldn’t feel too badly about that, as Mellette posed tough questions for teams all last season (among other highlights, he had 18 receptions against Richmond). Mellette was named first-team all-SoCon after last season. He gets compared a lot to former Elon star Terrell Hudgins, which could be a bit unfair (Hudgins, a former high school quarterback, may have been a better athlete), but there’s no doubt he’s a threat on any play and must be accounted for by the Bulldogs at all times. In last year’s game, Mellette was held to just three catches, one of the few positives for the Bulldogs’ D.
Elon is averaging 130 yards per game rushing, but that number is inflated by a 199-yard performance against Concord. The Phoenix rushing attack may have taken a hit with an injury to 6’4″, 311-lb. senior right guard Rodney Austin, who broke his foot last week and will be out for at least two months. Austin was a preseason second-team all-SoCon selection. The Phoenix is one for three in field goal attempts this season, after only making eight of fifteen last year. However, placekicker Adam Shreiner was a perfect 45-45 in PATs last year and that streak has continued this season (10-10). On defense, players to watch for Elon include middle linebacker Joshua Jones, a preseason second-team all-SoCon pick who leads the Phoenix in tackles, and free safety Blake Thompson, who had eleven tackles last year against The Citadel. As noted above, Thompson may be a key man as Elon battles against Triple O’Higgins. Jones and Thompson are responsible for over one-quarter of the Phoenix’s tackles for loss. Elon’s defensive line is not particularly large, with three of the starters weighing less than 250 lbs., but noseguard Tony Thompson checks in at 270 lbs. and already has two sacks this season. A backup of interest is David Wood, who played baseball for Elon the last two seasons and is now a reserve defensive back on the football team (Wood is also a kick and punt returner). Fashion alert: The Citadel’s game notes this week indicate the Bulldogs will wear white jerseys and white pants at Elon. I don’t think there are any secrets as to what The Citadel needs to do this week. Avoiding turnovers, as always, is a must. 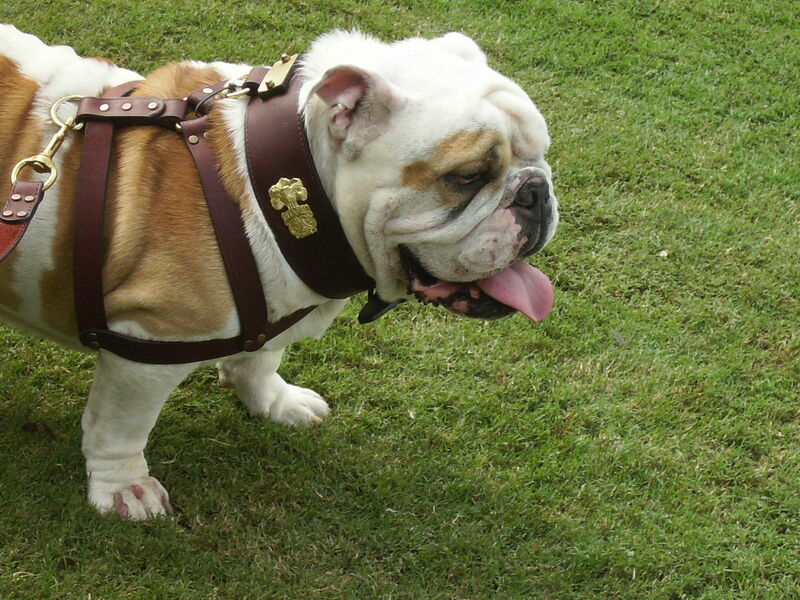 So far this year the Bulldogs have been okay in that respect, though there are still too many fumbles. When a big play is out there for the offense, it must take full advantage. That didn’t happen against Furman, and the Bulldogs paid for it. The defense needs to get off the field on third down, something it repeatedly failed to do against Elon last season. The D also needs to force some turnovers and sack the quarterback a time or two, or six. Jeremy Buncum has three tackles for loss this season, leading the team. The Citadel needs more of those types of plays. Based on early reports, there may be a very good crowd at Rhodes Stadium on Saturday, which is good (nothing worse than a dead atmosphere, at home or on the road). The last time The Citadel played at Elon, the Bulldogs lost 43-7 in a miserable performance, one of a number of less-than-stellar road outings in recent years. The Citadel has lost 15 of its last 17 road contests, although it is riding a one-game winning streak away from Johnson Hagood Stadium (last season’s finale at Samford). It would be nice to add to the road winning streak on Saturday. Okay, so maybe that wasn’t the sunniest intro of all time. I have to be honest here, though. While I am looking forward to the season, this year I am a bit apprehensive about what lies ahead for the Bulldogs on the gridiron. The Citadel is going to the triple option on offense, with a head coach who has never run the offense (or any similar offense) before, and with players who were mostly recruited for a very different kind of system. The Catamounts finished last in 2009, with only one league win. That one WCU victory came against The Citadel, which tied for next-to-last. More of the same is expected by those who follow the SoCon. Before beginning league play, though, The Citadel will play three non-conference games. Next week’s game at Arizona should be…interesting. The following week the Bulldogs will take on Presbyterian, a team that went 0-11 last season, including a 46-21 loss to The Citadel. However, even the Blue Hose would be favored against the Bulldogs’ opponent on Saturday, Chowan University, a Division II school located in Murfreesboro, North Carolina. 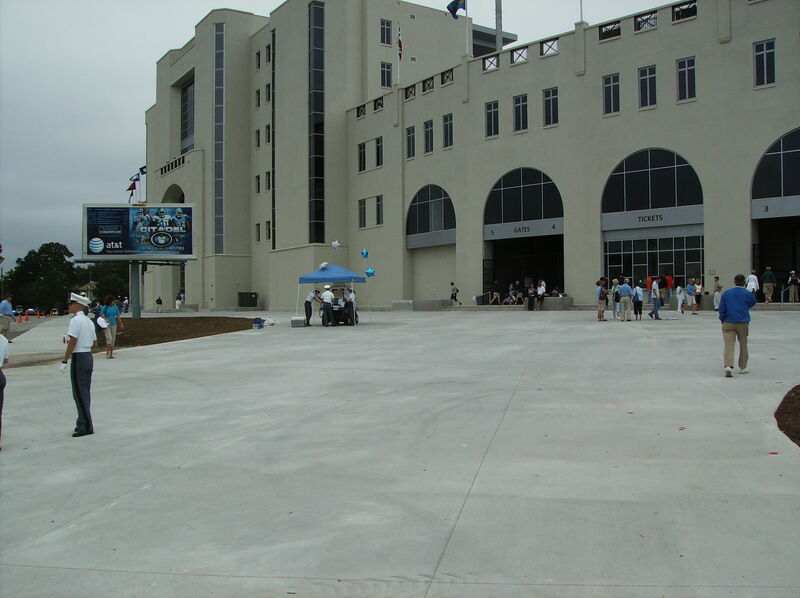 When the Hawks were announced as the opposition for the home opener, a collective yawn could be heard from The Citadel’s less-than-thrilled fans. It’s hard to blame anyone for not being excited about Chowan being on the schedule, with all due respect to that school. I’m guessing this game’s not going to be a sellout. Having said that, let’s take a look at Chowan. It’s pronounced CHO-WAN with a hard CH, just like CHOKE or CHICKEN. CHO-WAN. That’s from somebody who works at the school, so she ought to know, but two different people have insisted to me that it’s actually pronounced “Shuh-WONN”, with the “Sh” sound at the beginning and the accent on the second syllable. Since both of them are natives of eastern North Carolina, the region of the state that actually has decent BBQ, I tend to trust them. “Chowan” is a derivative of “Chowanoke”, the name given to the native tribe of the region by 16th-century European explorers. My guess is that if you were French, you pronounced it with the “Sh”, and if you were English, you went with the hard “Ch” sound. It’s kind of like Beaufort (BO-fert), North Carolina, and Beaufort (BYOO-fert), South Carolina. There is also a Chowan river, and a Chowan County — but Chowan University isn’t located in that county, but in the adjoining county of Hertford. Naturally, this school in northeastern North Carolina is named to honor a tribe whose name means “people of the south”. Regardless of its pronunciation, the school has been around in one form or another since 1848, when it was founded as Chowan Baptist Female Institute. The school remained all-female until 1931, but in 1937 it became a junior college. It reverted back to four-year status in 1992, and changed its name to the current Chowan University in 2006. This fall, it will offer its first Masters Degree program, in Elementary Education. Chowan remains affiliated with the Baptist State Convention of North Carolina. Many of our students are first generation college students which means their parents did not attend college or complete a college degree. Because of Chowan’s commitment to individual attention in a Christian environment, these students thrive here. I liked this statement. Too many schools insist on presenting themselves as wannabe Ivies, when everyone knows better. Here we have a school that knows exactly what its mission is, and what it wants to do, and isn’t apologetic about it in the least. Good for Chowan. Chowan had a fine run in football as a junior college, almost entirely under James Garrison, who was the head coach at the school for 43 years (and for whom its football stadium is named). Quite a few Chowan alums went on to four-year schools and then the NFL, including George Koonce, Curtis Whitley, and Mark Royals. However, Chowan has struggled on the gridiron since becoming a four-year school itself. Since 1993, the Hawks (formerly the Braves) have a cumulative record of 39-168-1 in Division III and (since 2005) Division II. That includes Saturday’s 59-10 loss to Lenoir-Rhyne. Chowan has been a football member of the Central Intercollegiate Athletic Association since the 2008 season (and is now a full member of the conference). Chowan is the first non-HBCU member of the CIAA in the league’s 98-year history. The CIAA now has 13 members, and as a result the conference’s slogan for this year is “Triskaidekaphobia: Fear the 13!” I’m not sure what the Southern Conference’s slogan would be — “The SoCon: The Nation’s Most Transient League”? Those last two seasons came under the direction of the current head coach, Tim Place. Place is a Washington & Lee alum who was previously the head coach at Urbana, an NAIA school in Ohio. One of the members of Place’s coaching staff is Omar Nesbit. Nesbit was an All-SoCon lineman at The Citadel, graduating in 2002. He is the Hawks’ offensive line coach. According to the school’s pre-season football guide, the team runs a “multiple” offense and a “multiple” defense. Thirteen starters are back from last year’s outfit. Last season the Hawks scored 25.3 points per game, not bad, but allowed 35.2 ppg. While the Hawks were a respectable passing team, all 25 of its TD passes were thrown by C.J. Westler, who was the offensive player of the year in the CIAA, and who is not among the returnees. Much like The Citadel, Chowan has to find a quarterback (it played two in the Lenoir-Rhyne game). Chowan turned the ball over three times per game, almost double its opponents’ totals, and averaged an anemic 2.9 yards per rush. The Hawks gave up 48 sacks. Defensively, the Hawks allowed 4.6 yards per rush and 9.3 yards per pass attempt, which is obviously not good. Opponents scored touchdowns 70% of the time when they entered the “red zone”. Chowan was also not a particularly efficient punting or placekicking team. Against Lenoir-Rhyne, Chowan allowed 513 rushing yards (6.9 per attempt). This is noteworthy in that L-R is running the same offensive system this season it ran last year under the direction of then-offensive coordinator Tommy Laurendine — who of course is now the offensive coordinator at The Citadel. After watching his quarterbacks combine for six interceptions and at least five fumbled snaps in Saturday’s scrimmage, Citadel football coach Kevin Higgins stated the obvious. You could say that, coach. On the bright side, nine of the eighteen pass attempts in the scrimmage were caught by Bulldogs. Alas, six of them were defenders. At least on those plays the QB got the snap from center. Unofficial totals from the scrimmage had the first-team offense rushing 27 times for 67 yards. At least the defense apparently looked good, although how much of that was due to the offense’s struggles is open to question. The kicking game again failed to impress, a problem Higgins has been unable to solve for the last two seasons. The scrimmage on August 28 was apparently better, based on some anecdotal reports. At this point it appears the Bulldogs will play two “true” freshman quarterbacks, Ben Dupree (from Pennsylvania) and Matt Thompson (from Florida). Terrell “First Sergeant” Dallas will be the fullback. There are several candidates to fill the slotback positions, led by Van Dyke Jones and injury-plagued Rickey Anderson (everyone’s crossing their fingers for you, Rickey). The offensive line has some experience, but not at center, which in part explains the center-QB exchange problems. We won’t know for sure exactly how the new offense will look until Saturday, but it probably will be a slightly different variation than Charlie Taaffe’s version of the wishbone. It’s not going to be quite like Wofford’s option attack, either. It’s probably going to most resemble the setup run by Paul Johnson at Georgia Southern, Navy, and now Georgia Tech. With that in mind, I wouldn’t be surprised if Kevin Higgins, with a personal history of running spread passing offenses, throws the ball a little more often than you see in most triple option offenses. He has to figure out a way to get talented tight end Alex Sellars involved in the offense. Higgins has also commented on the big-play ability of Domonic Jones, a 6’5″ redshirt freshman. I like the idea of isolating a tall receiver on a smaller defensive back in this offense. Of course, you have to have a quarterback capable of getting the ball to Jones. While the offense is filled with question marks, the defense should have a lot of answers. There is depth and talent on that side of the ball, particularly in the defensive backfield. Cortez Allen has drawn pre-season accolades. Other DBs with the potential to shine include Keith Gamble (who had an 89-yard interception return against Presbyterian last season) and Joseph Boateng (who intercepted two passes in his collegiate debut against North Carolina). Former safety Rod Harland is now a linebacker, joining team leader Tolu Akindele and Jeremy Buncum as likely starters. The defensive line should be solid, if a little young. Chris Billingslea had some impressive moments last season (and made the All-SoCon freshman team as a result). Keith Carter is a redshirt freshman who should draw notice, if only for being a defensive tackle who wears #33. The other defensive lineman (at least that’s his roster designation) I want to mention is Milford Scott, a special teams terror who blocked three kicks last season and created havoc many other times. He’s tall, has long arms, and describes himself as a “Charleston homeboy” from the beach. He’s a weapon. Unfortunately, Scott’s dynamism on special teams was an exception (not counting Andre Roberts, obviously). While punter Cass Couey fared reasonably well, the Bulldogs continued to struggle in the placekicking department. That’s two seasons in a row The Citadel has had sub-optimal kicking, and early returns suggest it might be three in a row. I don’t blame the kickers. I blame the coaching staff. It’s the job of the staff to get that aspect of the squad fixed, either by improving the kickers on the squad or finding somebody else to kick. The Citadel also could stand to improve its punt coverage team (Scott aside) and its kickoff return unit. The Bulldogs will sorely miss Andre Roberts as a punt returner; look for that component of special teams to not be as effective this season. There has been a lot of turnover in the coaching staff, not only with the new offensive scheme (where the aforementioned Laurendine is joined by offensive line coach Bob Bodine), but with the defense as well. Higgins recruited former Wofford assistant Josh Conklin to join the staff, and later named him defensive coordinator. Conklin will get help from another new assistant, Denny Doornbos, who was the defensive coordinator at Army during the Bob Sutton years, which were mostly good ones. I have to gleefully point out, though, that he was the DC for this game…and for this game, too. While all the talk in the off-season has been about the offensive scheme, and how the coaches will implement it, I think the new coaches on the defensive side of the ball will be just as important. Generally, you would like to have more staff continuity than The Citadel has had, but in the case of the defense, I think a fresh approach may be just what was needed. There was a sense over the last two seasons that the defense had underachieved; in particular, some observers felt the unit was not aggressive enough. The Bulldogs’ D must be pro-active this season, and give the offense short fields with which to work. The defense will likely also have to bail the offense out on a regular basis. This is going to be an important year for Kevin Higgins. The off-season issues, not surprisingly, did not sit well with the alumni — and I’m not just talking about the big boosters or the message board regulars. He also has had back-to-back disappointing seasons on the field. The move to a new offense, and the overhaul of his coaching staff, were both bold moves made by someone who expects to stick around for a while. They weren’t short-term stopgaps. That is to his credit, I think. Now, however, even with modest on-field expectations, he needs to get the fan base to buy into his program again. After all, Larry Leckonby and company need to sell tickets and sponsorships. Jerry Baker has Brigadier Club membership goals to obtain, whatever his methods are (high-tech, low-tech, begging, etc.). A 1:00 pm start time against Chowan on Labor Day weekend in Charleston probably isn’t going to be a big winner as far as attendance goes. I fully expect one of those hot-and-humid Lowcountry days that are fairly typical for this time of year. Ugh. Of course, that’s assuming a hurricane doesn’t come into play. I’ll be there anyway, though. I’m ready for some football. This is going to be a grab-bag type of post, a variety pack if you will. I may do this sort of thing periodically, as I really need to blog on a more regular basis. I look at this as a way to make shorter comments on various issues, mostly about sports (including sports at The Citadel), with a few other odds and ends that catch my eye. Think of them as Twitter entries that are longer than 140 characters. Speaking of Twitter, my latest tweets can be seen on the left side of this page. 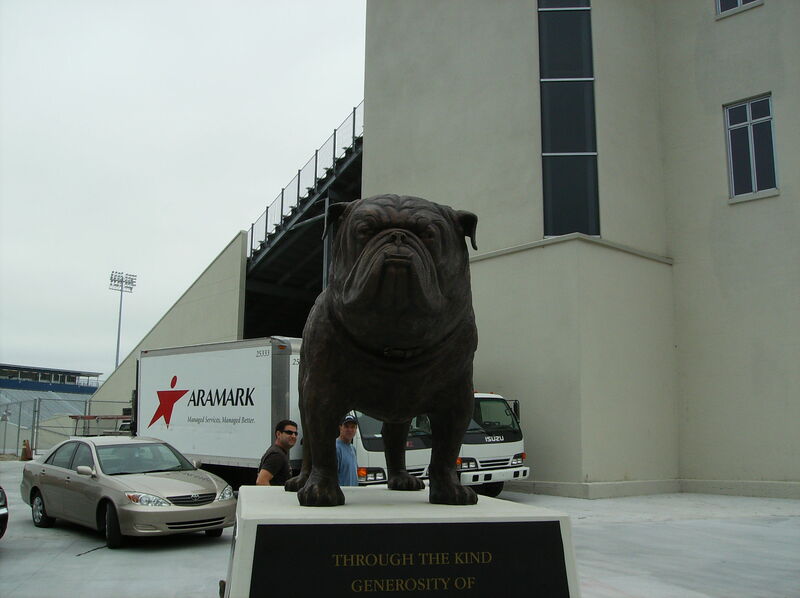 If anyone hasn’t noticed and is halfway interested in following me on Twitter, the location is http://twitter.com/SandlapperSpike (my tweets feature links/comments on a lot of stuff, including up-to-the-minute updates on Bulldog sports, baseball, football, and soccer, among other things). As The Citadel counts down to kickoff against Chowan (as of today, T-41 days! ), it’s time to focus on the Bulldogs’ new offense, which may be a little like an old offense, namely Charlie Taaffe’s wishbone attack. However, it appears that Kevin Higgins may intend to run more of a “spread” triple option than Taaffe’s offense. Another reason to pay attention to the triple option is that Georgia Southern is also going to start running the offense this season, in a return to its roots. For those interested in a breakdown of the nuts and bolts of the triple option, then, I cannot recommend highly enough a visit to The Birddog, the blog of choice for Navy football (and lacrosse). The Birddog does a great, great job of illustrating (with video!) the intricacies of the triple option attack. I’ve picked out four posts that I think serve as a good introductory primer for what the offense is all about. (I hope I’ve chosen correctly.) While reading these, just in case anyone gets confused, keep in mind that Paul Johnson is the former head coach at Navy (and Georgia Southern, of course) and is now at Georgia Tech. The current Navy head coach is Ken Niumatalolo, and his offensive coordinator is Ivin Jasper. As of today, only one of The Citadel’s football games is scheduled to be televised (at Wofford on October 30). There is always a chance that a local station (either in Charleston or another SoCon town) will elect to broadcast a game, although that is unlikely. Other than that scenario, there are only two other games that could be televised. It is possible (but doubtful) that SportSouth will pick up the November 20 game at Samford as part of its “SoCon Saturday” package, as the last two weekends of the regular season are “wild card” weekends — basically, the network will televise the most attractive matchup that week, based on the teams’ records to that point in the season. Admittedly, very few prognosticators are going to bet that a game between Samford and The Citadel will have serious repercussions in the league standings, but you never know. However, there is a decent chance that The Citadel’s game at Arizona on September 11 will be televised by Fox Sports Net Arizona (FSN-AZ), a regional sports network received by cable subscribers in Arizona (and I believe parts of California and New Mexico), and also available as part of DirecTV’s “Sports Pack”. Arizona has asked the Pac-10 (and the league’s TV partners) for a waiver in order for the game to be broadcast. The reason a waiver is needed is because there are already two Pac-10 games scheduled to be televised during the same time period, and that league’s national cable partners have television exclusivity rights for those games. In other words, a local/regional broadcast can’t take place at the same time as a nationally televised league TV game. If another Pac-10 school wants its game on television, it has to play in another time slot. However, Arizona and Arizona State have been given waivers in the past because home game time slots for those schools are limited, especially early in the season. You just can’t play a football game in the desert in the midday heat. We’ll see what happens. I am cautiously optimistic that the game will be televised. The NCAA Baseball Rules Committee passed legislation that, if approved, will establish a time clock in college baseball. The committee is basically incorporating the rules employed by the SEC for its 2010 conference tournament. The 20-second rule for throwing a pitch was already on the books, but now it will be enforced with a timer, as will the amount of time allocated between innings. I’ll be interested to see how the Southern Conference handles this; will it have a visible clock, with a timekeeper in the press box monitoring it? Or will it just have an umpire carrying a watch? I’m guessing the latter, for financial reasons. The committee also modified the obstruction rule, which got a lot of notoriety in the Southern Conference tournament thanks to the second-round game/brawl between The Citadel and Elon. That was the second-wildest fight I’ve ever seen at the SoCon tourney (nothing compares to the epic Raleigh/Piepenbrink donnybrook in 1990, though). Not about sports: you can be assured that I will never quote from or link to the Las Vegas Review-Journal. Why, you ask? This is why. I sincerely hope that the Review-Journal goes bankrupt sooner rather than later. Also, the photo of the CEO in the first link — doesn’t he look like a guy who hopes you throw something at him, so that he can sue you? I have a great deal of respect for copyright law. I think this guy and the Review-Journal (which is funding him) are abusing copyright law. Finally, a new feature, the Plant of the Week. That’s right, plants. 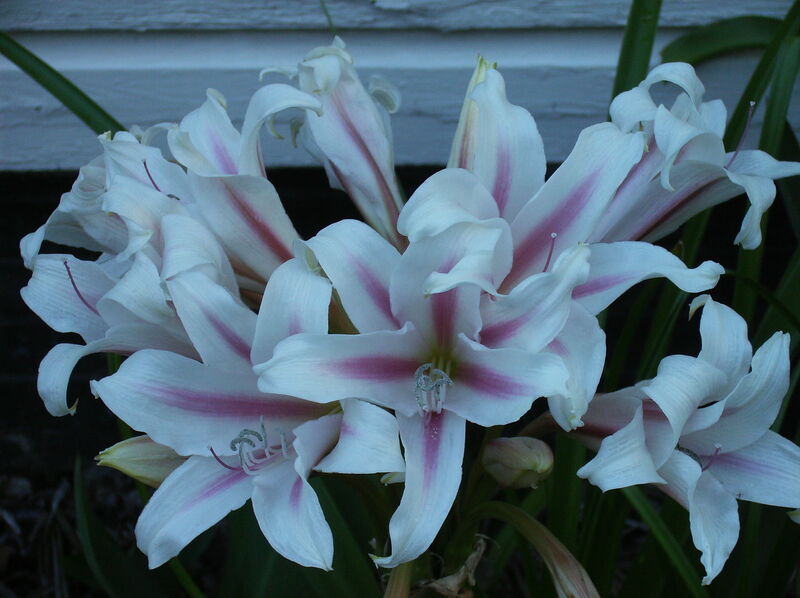 As I’ve said elsewhere on the blog, I consider gardening a sport. In honor of this being the first edition of the PotW, I will honor not one but two plants in my garden. 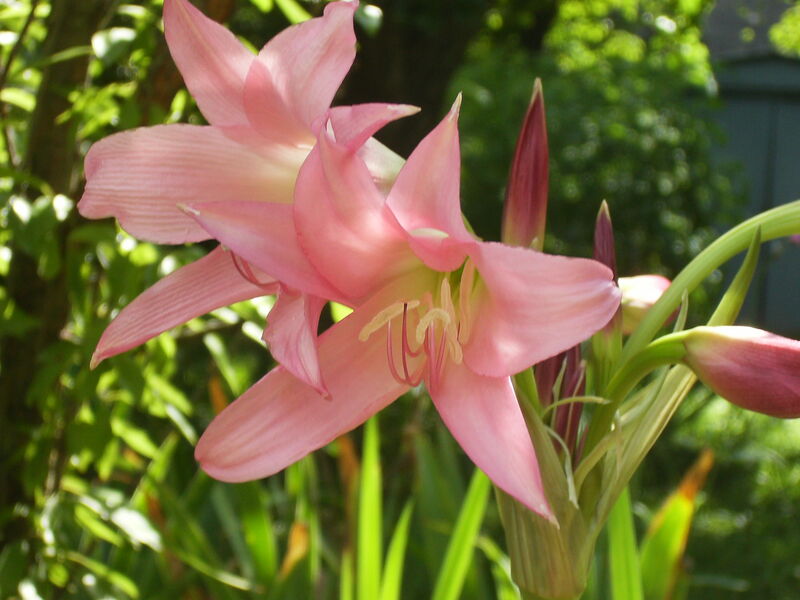 Both are crinums. Feast your eyes on a Powelii (Cecil Houdyshel) and a Herbertii (no common name).